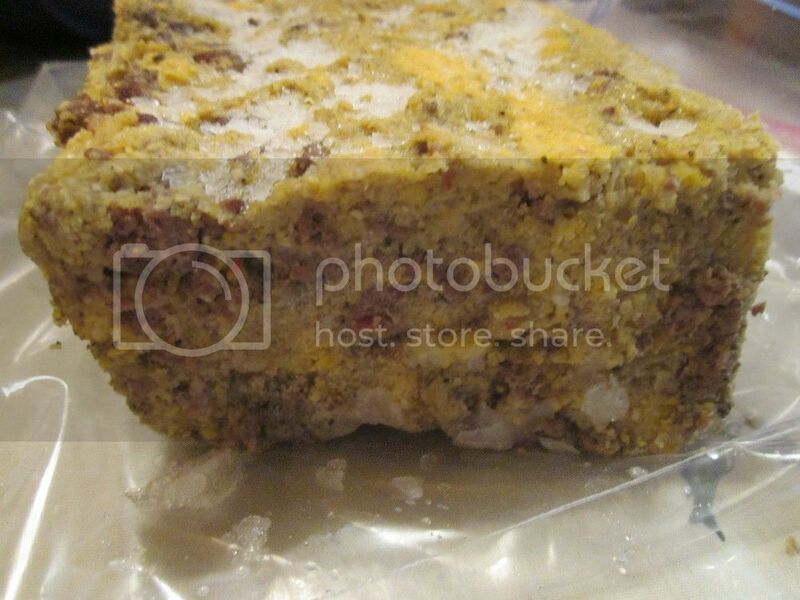 I never had tasted scrapple before, so I made up a batch of this yesterday. I like it. 1. Crumble the sausage and cook in frying pan about 5 minutes. Drain off excess fat. Add liquid and bring to a boil. Sift in cornmeal, stirring constantly. Cook until mixture thickens. Add seasoning. Turn into loaf pan and let cool. Slice thin and fry.. It ain't pretty, but it sure tastes good. I froze it last night and the white on top is frost. Thanks. Bet it looks even better fried! Sounds good, the only scrapple I've had was in Ohio scrapple country and was soooo greasy that a it took a vinegar rinse to cleanse the roof of the mouth so I swore off but this sounds pretty darn good. Will have to try. This is not very greasy. When I was very young my Grandmother made a loaf of something. She called it souse, but I kind of think it was scrapple. It was so greasy I couldn't eat more than a bite or two of it and it had so many spices in it it was overwhelming. Didn't like that.